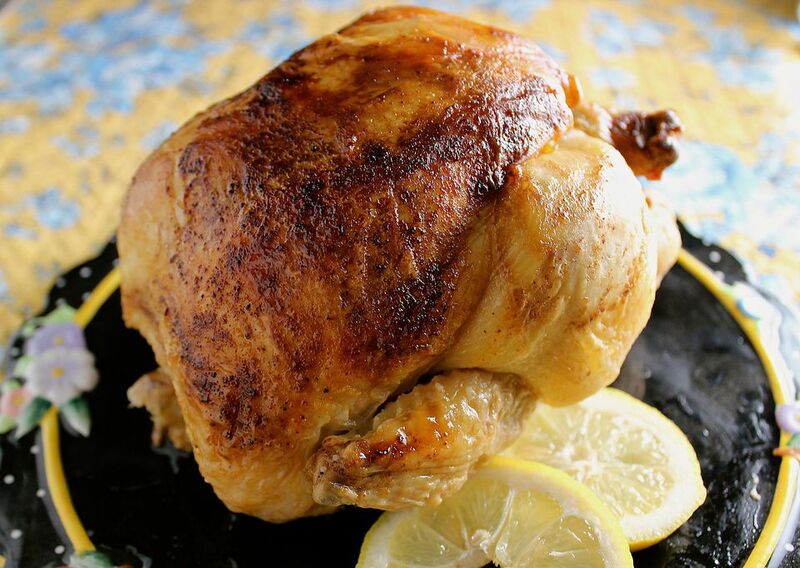 Everybody loves chicken, and when it's roasted with lemon and garlic, the skin becomes crisp and flavorful, the meat is tender and juicy, and the pan juices are rich and savory. This is one of the easiest elegant dinner menus. You can make the creamy potato casserole ahead of time and store it in the fridge until it's time to bake it. The fresh fruit salad can also be made ahead and stored in the refrigerator, tightly covered. And the dessert; it's one of my favorites. My husband requests it every year for his birthday cake. If you are fairly confident about carving, it's very festive to carve the chicken at the table. If not, carve it in the kitchen and arrange on a large platter, pour the pan juices over, and garnish with fresh herbs. Since the potatoes and the chicken bake at the same temperature, they also bake at the same time; just use different oven racks, baking the potatoes on the rack underneath the chicken. When a meat thermometer registers 165° F in the thigh, the chicken is done. Uncover the casserole and let it bake a few minutes longer to brown and crisp the top while the chicken rests, covered, to let the juices redistribute. Then call everyone to the table and enjoy your wonderful meal. This super easy recipe only requires one thing of you: a meat thermometer. For safety's sake, the internal temperature must register 165 degrees in the thickest part of the thigh. Let the chicken stand for 10 minutes before carving, then serve with the pan juices. This casserole is just plain delicious. It's creamy, cheesy, tender, and meltingly wonderful; the perfect complement to roast chicken. Fresh asparagus is pretty easy to find this time of year. If you can't find any that looks good, just substitute frozen asparagus (not canned!) and follow the package directions for cooking. There is nothing like crisp, crunchy, meltingly tender bread slathered with garlic butter to complement a meal. Make sure to serve this recipe hot out of the oven. I've given you two versions of this recipe; one is two-layer and easier, the other is a four-layer beauty. Whichever you choose to make, they are spectacular!